Artemisia tridentata, commonly called big sagebrush,:264 Great Basin sagebrush:264 or (locally) simply sagebrush, is an aromatic shrub from the family Asteraceae, which grows in arid and semi-arid conditions, throughout a range of cold desert, steppe, and mountain habitats in the Intermountain West of North America. 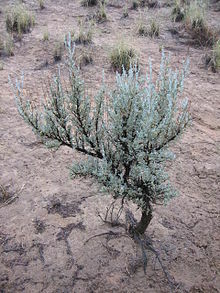 The vernacular name “sagebrush” is also used for several related members of the genus Artemisia, such as California sagebrush (Artemisia californica). Big Sagebrush and other Artemisia shrubs are the dominant plant species across large portions of the Great Basin. The range extends northward through British Columbia‘s southern interior, south into Baja California, and east into the western Great Plains of New Mexico, Colorado, Nebraska, and the Dakotas. Several major threats exist to sage brush ecosystems, including human settlements, conversion to agricultural land, livestock grazing, invasive plant species, wildfires, and climate change. Sagebrush provides food and habitat for a variety of species, such as sage grouse, pronghorn antelope, grey vireo, pygmy rabbit, and mule deer. Artemisia tridentata is the state flower of Nevada. Much discussion and disagreement revolves around the question of how to divide the species into varieties and subgenera. The following subspecies are accepted by some authors, though others advocate different systems. A. tridentata subsp. wyomingensis (“Wyoming big sagebrush”) – Found in the drier portions of the sagebrush steppe. Shrub density is generally less than 1 plant/m2, with little herbaceous cover surrounding the shrub. Big sagebrush is a coarse, many-branched, pale-grey shrub with yellow flowers and silvery-grey foliage, which is generally 0.5–3 m tall. A deep taproot 1–4 m in length, coupled with laterally spreading roots near the surface, allows sagebrush to gather water from both surface precipitation and the water table several meters beneath. Big sagebrush that is over a meter tall is an indicator of arable land, because it prefers deep, basic soils. Sagebrush is generally long-lived once it makes it past the seedling stage, and can reach ages of over 100 years. The species has a strong pungent fragrance (especially when wet) due to the presence of camphor, terpenoids and other volatile oils. The taste is bitter and, together with the odor, serves to discourage browsing by many herbivores. It is an evergreen shrub, keeping some of its leaves year-round (although it loses many of them in the late summer). The leaves—attached to the branches at the axillary nodes—are wedge-shaped, 1–3 cm long and 0.3–1 cm broad, with the wider outer tips divided into three lobes (hence the scientific name tridentata). The leaves are covered with fine silvery hairs. Artemisia tridentata flowers in the late summer or early fall. The small yellow flowers are in long, loosely arranged tubular clusters. The fruits are seed-like, and have a small amount of hairs on the surface. The Cahuilla used to gather large quantities of sagebrush seed, and grind it to make flour. Big sagebrush can also reproduce through sprouts, which shoot up from the underground rhizome. The sprouts are an extension of the parental plant while seedlings are completely individualistic to any other plant. Among these two strategies, the seedlings need more moisture for germination and early survival. This is due to the sprouts being connected to already healthy and associated plants while the new seedlings will start anew. Sagebrush habitat in Eastern Washington. Artemisia tridentata grows in arid and semi-arid conditions, throughout the Intermountain West of North America. Sagebrush is not a desert plant, but rather a resident of the steppe, in areas that receive 18–40 centimeters (7.1–15.7 in) of annual precipitation. Big sagebrush and other Artemisia species are the dominant plants across large portions of the Great Basin, covering some 422,000 square miles (1,090,000 km2) in 11 western U.S. states and Canadian provinces. Sagebrush provides food and habitat for a variety of animal species, such as sage grouse, pronghorn, grey vireo, pygmy rabbit, and mule deer. Sagebrush also creates habitat for many species of grasses and herbs. Besides providing shade and shelter from the wind, the long taproot of sagebrush draws water up from deep in the soil, some of which becomes available to these surrounding shallow-rooted plants. Sagebrush provides habitat and food for a variety of animal species, such as this sage grouse. The terpenoid compounds in big sagebrush are thought to ward off herbivores. These oils, at high concentrations, are toxic to the symbiotic bacteria in the rumen of some ruminants like deer and cattle. Pronghorn are the only large herbivore to browse sagebrush extensively. Damage to sagebrush plants caused by grazing herbivores results in the release of volatile chemicals, which are used to signal a warning to nearby plants, so that they can increase the production of repellent chemical compounds. This plant-to-plant communication can take place at distances of up to 60 cm. 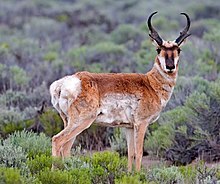 Pronghorn are the only large herbivores who browse on sagebrush extensively. Several major threats exist to sage brush ecosystems, including human settlements, conversion to agricultural land, livestock grazing, invasive plant species, wildfires, and climate change. The cattle industry burns large areas of sagebrush habitat to make way for grazing animals. Due to large periods of time where sagebrush was the primary shrub, many species have become adapted to this habitat. The burning of the shrubs leads to habitat loss of many species and can be very detrimental to the ecosystem as a whole. Furthermore, the destruction of native grasses and forbs by grazing and fire creates conditions where invasive plants colonize the area. The invasive species which has destroyed the largest amount of sagebrush habitat is cheatgrass (Bromus tectorum). Since its accidental introduction in the 1890s, cheatgrass has radically altered the native shrub ecosystem by replacing indigenous vegetation, and by creating a fire cycle that is too frequent to allow sagebrush to re-establish itself. Sagebrush is not fire-tolerant and relies on wind-blown seeds from outside the burned area for re-establishment. Some tree species have also been encroaching on big sagebrush habitat. For example, in the Warner Mountains in California white fir (Abies concolor) has been out-competing big sagebrush. Big sagebrush is used as a herbal medicine by Native Americans throughout the Intermountain West of North America, most notably as a smudging herb. It is also used for preventing infection in wounds, stopping internal bleeding, and treating headaches and colds. Chemically, the active medicinal constituents include camphor, terpenoids, and tannins. The Navajo use the vapors of sagebrush as a treatment for headache. 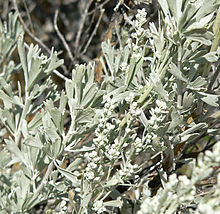 The Okanagan and Colville people used sagebrush to smoke hides. Among the Zuni people, an infusion of the leaves is used externally for body aches. The infusion is also taken as a cold medicine. It is also placed in shoes to treat athlete’s foot, fissures between toes, and as a foot deodorant. Sagebrush essential oil contains approximately 40% l-camphor; 20% pinene; 7% cineole; 5% methacrolein; and 12% a-terpinene, d-camphor, and sesqiterpenoids. The plant’s oils are toxic to the liver and digestive system of humans if taken internally, so care must be taken during any form of internal use. Generally, toxic symptoms will subside 24–48 hours after ingesting the plant. ^ The Plant List, Artemisia tridentata Nutt. ^ a b Barbour, Michael G.; Billings, William D. (2000). 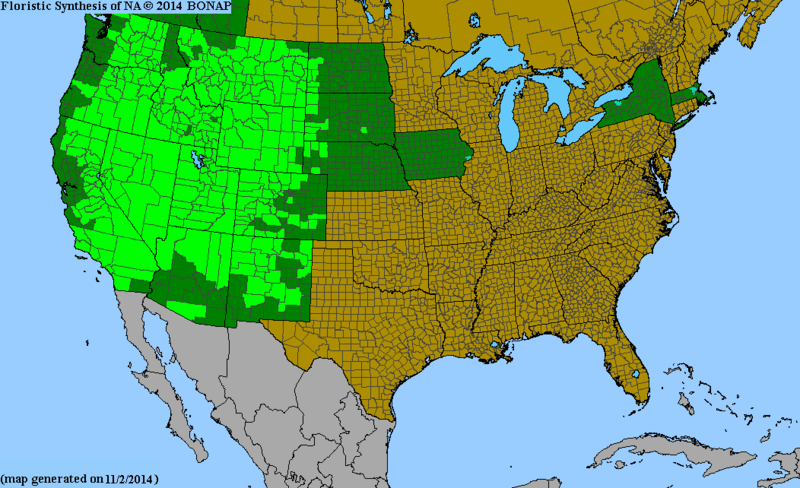 North American Terrestrial Vegetation. Cambridge University Press. p. 259. ISBN 9780521559867. ^ Barbour, Michael G.; et al. (2007). Terrestrial Vegetation of California. University of California Press. p. 599. ISBN 9780520249554. ^ Brayshaw, T.C. (1996). “Artemisia tridenta Nutall. (Big Sagebrush)”. Trees and Shrubs of British Columbia. University of British Columbia Press. p. 337. ISBN 9780774805643. ^ Mozingo, Hugh N. (1987). Shrubs Of The Great Basin: A Natural History. University of Nevada Press. p. 271. ISBN 9780874171129. ^ Baldwin, Bruce G. (2002). The Jepson Desert Manual: Vascular Plants of Southeastern California. University of California Press. p. 117. ISBN 9780520227750. ^ Ferris, Roxana A.; Abrams, LeRoy (1960). “Artemisia tridentata Nutt. Sagebrush”. Illustrated Flora of the Pacific States, Vol. IV: Bignonias to Sunflowers. Stanford University Press. p. 412. ISBN 9780804700061. ^ Stuart, John D. & Sawyer, John O. (2001). “Big Sagebrush (Artemisia tridentata)”. Trees and Shrubs of California. University of California Press. p. 169. ISBN 9780520221093. ^ a b Clarke, Charlotte B. (1978). “Big Sagebrush”. Edible and Useful Plants of California. University of California Press. p. 134. ISBN 9780520032675. ^ a b Kershaw, Linda (2001). “Big sagebrush”. Rare Vascular Plants of Alberta. University of Alberta. p. 25. ISBN 9780888643193. ^ Raven, Peter H. (1996). Native Shrubs of Southern California. University of California Press. p. 54. ISBN 9780520010505. ^ Tilford, Gregory L. (1997). Edible and Medicinal Plants of the West. Mountain Press Publishing. p. 208. ISBN 9780878423590. ^ Jaeger, Edmund C. (1940). Desert Wild Flowers. Stanford University Press. p. 302. ISBN 9780804703659. ^ Smith, Stanley D.; et al. (1997). Physiological Ecology of North American Desert Plants. Springer. p. 107. ISBN 9783540531135. ^ Mozingo, Hugh N. (1987). Shrubs Of The Great Basin: A Natural History. University of Nevada Press. p. 270. ISBN 9780874171129. ^ Müller-Schwarze, Dietland (2006). Chemical Ecology of Vertebrates. Cambridge University Press. p. 310. ISBN 9780521363778. ^ Smith, Genny (2000). Sierra East: Edge of the Great Basin. University of California Press. p. 168. ISBN 9780520086890. ^ Barbour, Michael G.; et al. (2007). Terrestrial Vegetation of California. University of California Press. p. 593. ISBN 9780520249554. ^ Cresser, Malcolm S. & Smith, Keith A. (2003). Soil and Environmental Analysis: Modern Instrumental Techniques. CRC Press. p. 364. ISBN 9780824756949. ^ Nagy, JG and RP Tengerdy. 1968. Antibacterial action of essential oils of Artemisia as an ecological factor: II. Antibacterial action of the volatile oils of Artemisia tridentata (big sagebrush) on bacteria from the rumen of mule deer” Applied and Environmental Microbiology 16(3) 441-444. ^ Rogosic, J.; et al. (2011). “Importance of plants with medicinal properties in herbivore diets”. In Casasús, I.; Rosati, Andrea (eds.). Animal Farming and Environmental Interactions in the Mediterranean Region. Wageningen Academic Pub. pp. 47–48. ISBN 9789086861842. ^ Lentz, David L. (2000). Imperfect Balance: Landscape Transformations in the Precolumbian Americas. Columbia University Press. p. 49. ISBN 9780231111560. ^ Holopainen, Jarmo K.; Blande, James D. (2012). “Molecular Plant Volatile Communication”. In López-Larrea, Carlos (ed.). Sensing in Nature. Springer. p. 20. ISBN 9781461417033. ^ Knick, Steven T.; Connelly, John (2011). Greater Sage-Grouse: Ecology and Conservation of a Landscape Species and Its Habitats. University of California Press. p. 145. ISBN 9780520267114. ^ Shepherd, Jay F.; et al. “Landscape Fragmentation and Non-Breeding Greater Sage-Grouse”. In Sandercock, Brett K.; et al. (eds.). Ecology, Conservation, and Management of Grouse. University of California Press. p. 78. ^ Wambolt, C.L. ; Walhof, Frisina (March 2001). “Recovery of big sagebrush communities after burning in south-western Montana”. Journal of Environmental Management. 61 (3): 243–252. doi:10.1006/jema.2000.0411. ^ Radosevich, Steven R.; et al. (1997). Weed Ecology: Implications for Management. John Wiley & Sons. pp. 29–30. ISBN 9780471116066. ^ Radosevich, Steven R.; et al. (2007). Ecology of Weeds and Invasive Plants: Relationship to Agriculture and Natural Resource Management. John Wiley & Sons. pp. 26–29. ISBN 9780471767794. ^ This is in contrast to many of the other plants which share its habitat, such as Rabbitbrush, Ephedra and bunchgrasses, which can root-sprout after a fire. ^ Boersma, P.D. ; Van Buren, Amy N. (2006). Invasive Species in the Pacific Northwest. University of Washington Press. p. 36. ISBN 9780295985961. ^ Vale, Thomas (1975). “Invasion of big sagebrush (Artemisia tridentata) by white fir (Abies concolor) on the southeastern slopes of the Warner Mountains, California”. Western North American Naturalist. 35 (3). ^ Kay, Margarita (1996). Healing with Plants. University of Arizona Press. pp. 106–107. ISBN 9780186516465. ^ Pennacchio, Marcelo; et al. (2010). Uses and Abuses of Plant-Derived Smoke: Its Ethnobotany As Hallucinogen, Perfume, Incense, and Medicine. Oxford University Press. p. 48. ISBN 9780195370010. ^ Shakhnoza, Azimova S.; et al. (2012). Lipids, Lipophilic Components and Essential Oils from Plant Sources. Springer. p. 844. ISBN 9780857293237.